The Milwaukee Brewers, just before the non-waiver trade deadline expires, have acquired infielder Jonathan Schoop (pronounced “Scope”) from the Baltimore Orioles in exchange for second baseman Jonathan Villar, right-handed pitcher Luis Ortiz and infielder Jean Carmona. The 26-year-old Schoop was hitting .244 with 17 HR and 40 RBI in 85 games with the Orioles this season. He made a total of 84 starts, all at second base. Schoop has hit safety in 22 of his last 23 games, batting .360 with 9 HR and 19 RBI during that stretch. He brings a 12-game hitting streak to Milwaukee, posting a .345 batting average (19-for-55) with 7 HR and 16 RBI. Schoop is under team control through the 2019 season and has played his entire six-year career with Baltimore. His career average is .261 with 106 HR and 312 RBI in 635 games. The Milwaukee Brewers fell out of first place in the NL Central Division, falling to the Chicago Cubs 7-2 in 11 innings on Monday night at Miller Park. It’s the seventh straight loss for the Brewers in their series with the Cubs this season, falling to 1-8 overall against their rivals to the south. Ryan Braun took a home run away from Cubs catcher Wilson Contreras in the sixth inning, but the Cubs finally got to Josh Hader in the 8th. They tied the game 2-2 when Jason Heyward singled to drive in Ben Zobrist. Brewers Defeat Cardinals 8-3; Best Record in N.L. 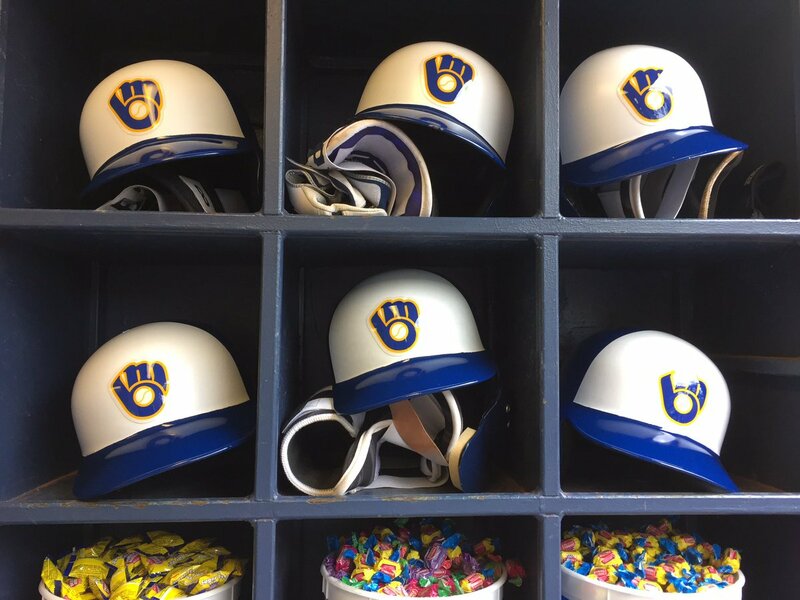 The Brewers lead in the National League Central grew to 4.5 games Monday after an 8-3 in the series opener against the St. Louis Cardinals. Milwaukee jumped out to a 4-0 lead through four innings, only to see the Cardinals pull to within a run thanks to a 3 run fifth. The lead was 5-3 in the bottom of the seventh when Jonathon Villar’s 3-run homerun opened the game up at 8-3. Ryan Braun, dropped to fifth in the batting order, went 3-for-3, and Christian Yelich was 2-for-4 to raise his average to .310. Brent Suter (5-3) allowed three runs in five innings, with six strikeouts to earn the victory. The bullpen was stellar again, as Taylor Williams, Matt Albers and Jacob Barnes combined for four shutout innings and just one hit allowed. The Brewers are now 35-20, which is the best record in the National League. The Brewers are 19-7 over their last 26 games, 14-4 over their last 18 games and 10-2 over their last 12 games, including a current 4-game winning streak. Game two of the three game series is Tuesday, with Zach Davies throwing against Michael Wacha. The Milwaukee Brewers managed just two hits on Sunday, in a 9-0 loss to the Pittsburgh Pirates at Miller Park. Pirates pitcher Chad Kuhl continued to dominate the Brewers, allowing just one hit in seven innings and not allowing the crowd of 38,285 to ever get going. It’s the seventh time this season the Brewers have been shutout, after being blanked just eight times all of last year. Brent Suter and four relievers combined to toss a shutout to lead the Milwaukee Brewers to a 3-0 win over the Pittsburgh Pirates at PNC Park on Monday night. Suter (3-2) tossed five shutout innings to earn the win. He scattered five singles and struck out four. Corey Knebel, who hadn’t pitched in five days, worked the 9th to notch his 36th save. Ryan Braun put the Brewers on the board with a solo home run to left center in the fourth inning, his 17th of the season. Scooter Gennett clubbed a three-run home run during a five-run seventh inning to lead the Cincinnati Reds to a 9-3 win over the Milwaukee Brewers on Tuesday night at Great American Ball Park. It pushes Gennett’s home run total to 24 for the season. Robert Stephenson improved his record to 4-4, allowing one run with seven strikeouts in six-plus innings for the Reds. Raisel Iglesias got six outs for his 25th save as the Reds have taken the first two games in the series. Travis Shaw clubbed a two-run home run for the Brewers. Zach Davies saw his record drop to 16-8, despite giving up just one earned run in 5 2/3 innings. 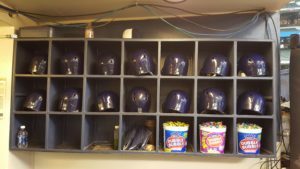 The Milwaukee Brewers wrapped up the month of August with a 6-3 win over the Washington Nationals at Miller Park on Thursday. Zach Davies pitched seven strong innings to pick up his 16th win of the season, tying Arizona’s Zach Greinke for the major-league lead. 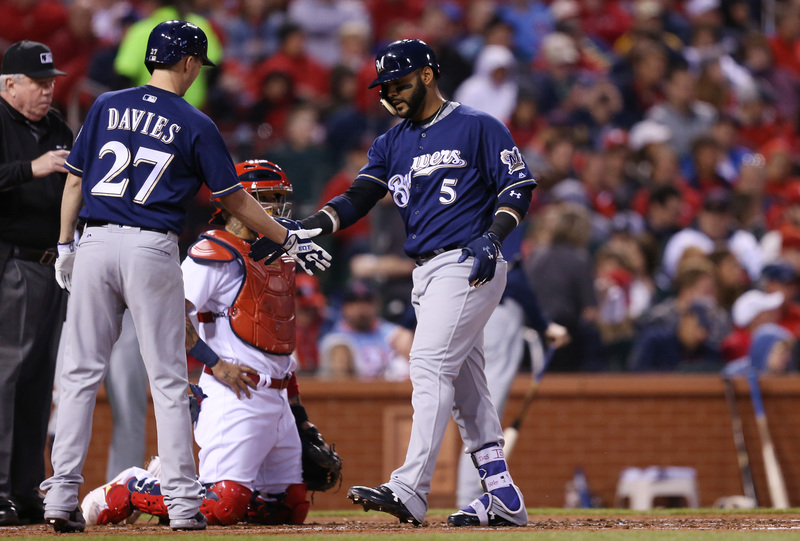 Jonathan Villar had three hits, including a two run home run in the fifth, giving the Brewers a 5-2 lead at the time. The long ball came from the right side of the plate, just his second of the season. The Brewers go to Gio Gonzalez, who had a 0.79 ERA over his last five starts. He left after six innings, having allowed 5 runs on 8 hits. It was the most runs he has allowed since May 8 against the Baltimore Orioles at Camden Yards. 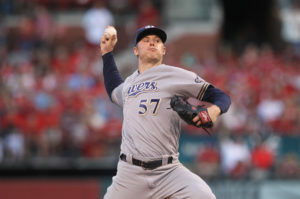 Jimmy Nelson (10-6, 3.75) pitches game two of the series for the Brewers tonight. Washington counters with Tanner Roark (11-8, 4.63). Milwaukee Brewers manager Craig Counsell said Thursday that right-handed starter Matt Garza will not make his next scheduled start on Sunday against the Nationals. 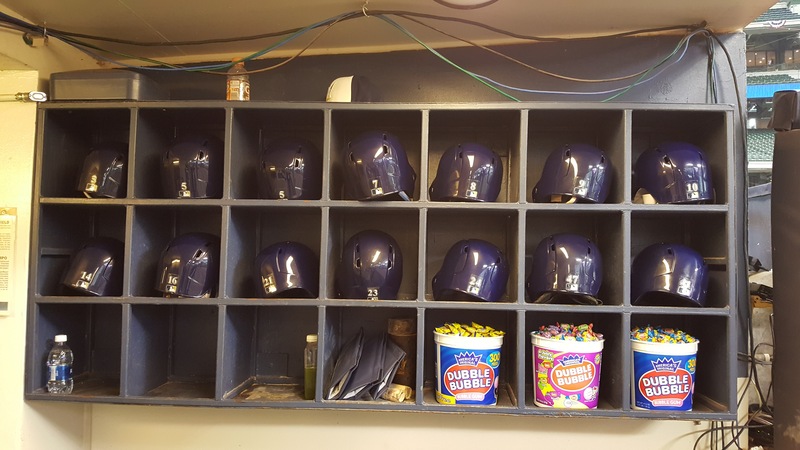 The Brewers didn’t announce a replacement at this point, but lefty Brent Suter would appear to be a strong candidate after he made a rehab start for the Wisconsin Timber Rattlers this week. 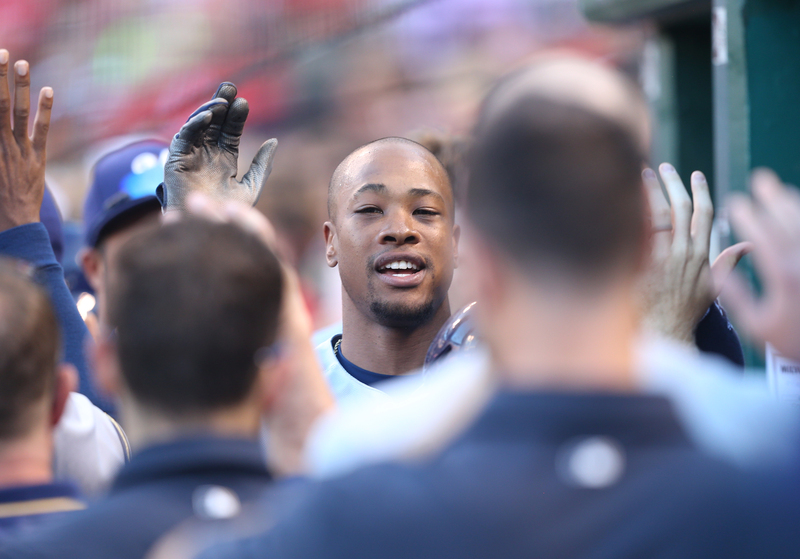 Keon Broxton was inserted into Wednesday’s game as a late inning, defensive substitution. The move by manager Craig Counsell paid off in a big way for the Milwaukee Brewers. With Corey Knebel on to protect a 6-5 lead and close out the win, Randal Grichuk sent one to the wall in center. Broxton, who has played the hero before, jumped high to bring the ball back and squeeze it for the final out. 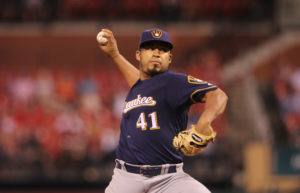 It gave the Brewers a 6-5 win over the St. Louis Cardinals and a split of their two game series at Miller Park. Knebel recorded his 30th save of the season for the Brewers. Tommy Pham clubbed a pair of two run homers for the Cardinals. The first came in the first off of Chase Anderson. The second was in the 8th off of Anthony Swarzak that made it a one-run game. Grichuk had also homered off of Anderson in the sixth inning to tie the game 3-3. The Milwaukee Brewers held off Pittsburgh on Tuesday night, pulling out a 3-1 win over the Pirates in their series opener at Miller Park. Zach Davies kept the Pirates off balance, allowing a run on six hits in 6 2/3 innings to earn his 14th victory (14-6) of the season. It was a good bounce back win for Davies, who struggled in his last outing. 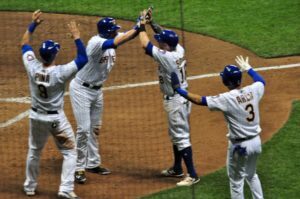 Manny Pina drove in a pair of runs for the Brewers and Keon Broxton clubbed a pinch hit home run in the 7th to close out the scoring between the two teams. 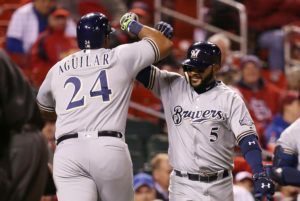 The Milwaukee Brewers clubbed six home runs on Thursday night and rolled to a 11-3 win over the Cincinnati Reds at Great American Ball Park. They salvaged the final game of their three game series with the victory. Things started just three batters into the game when Ryan Braun went yard. Jonathan Villar hit a pair of dingers in his first start since coming off the disabled list. Jesus Aguilar, Manny Pina and Domingo Santana also added long balls in the win. Jimmy Nelson (6-4) earned the victory, pitching seven strong innings. He allowed just two runs on three hits with one walk and 11 strikeouts. Two of the three hits allowed were home runs off the bat of Joey Votto, his 22nd and 23rd of the season. 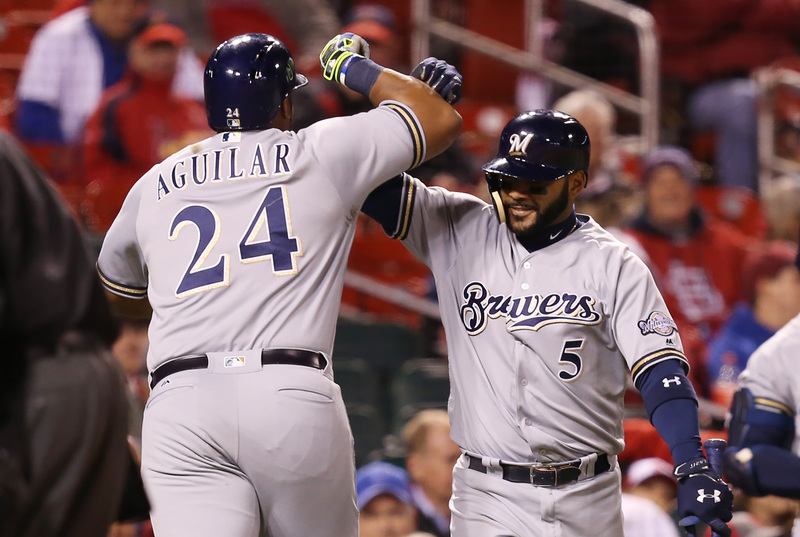 The Brewers clubbed six home runs in a game for the sixth time in franchise history. It’s the first time they’ve accomplished the feat since September 9, 2007. Ryan Braun’s first inning home run is the 39th in his career off of Reds pitching. The Brewers return home to Miller Park on Friday night to face the Miami Marlins. Matt Garza (3-4, 4.43) goes for the Brewers. Edinson Volquez (4-8, 4.15) pitches for Miami.